Designed to hold Quadrajet and both square and spreadbore Holley carbs, this tool greatly simplifies carburetor work. Manufactured of cast aluminum with open center and mounting pegs. 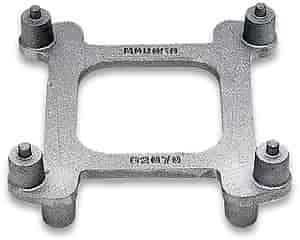 62070 - Moroso Carburetor Work Stands is rated 5.0 out of 5 by 2. Rated 5 out of 5 by copcarz from Perfect carb work stand I have not found anything better than this Moroso carb stand. Virtually indestructible and good for storage of carbs when not in use.